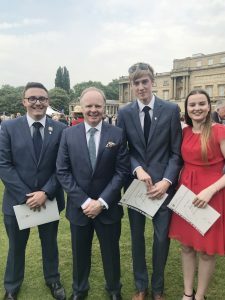 THREE Frome Community College students, Ben Manning, Dan Weston and Rebecca Marshall, received their Gold DofE Awards at Buckingham Palace on Thursday 24th May. The students were presented with their awards by actor Jason Watkins before being allowed time in the palace gardens. Ben said, “I just want to say a huge thanks to Mr Marsh for everything that he has done to help us achieve our Gold DofE Awards. Without him, we wouldn’t have got there! His dedication to us and our awards, including driving us 16 hours to Scotland, was instrumental in us achieving our Gold. No words will ever express my thanks.